Revolution announced today that a 25th Anniversary Collection is soon to be released on PC. The box set includes physical copies of the Broken Sword series of games, In Cold Blood, Beneath a Steel Sky, and Lure of the Temptress. Furthermore, the package will contain a selection of tracks from game soundtracks, various comics, posters, a Broken Sword USB, and, perhaps the most interesting, a six part documentary covering the history of Revolution. 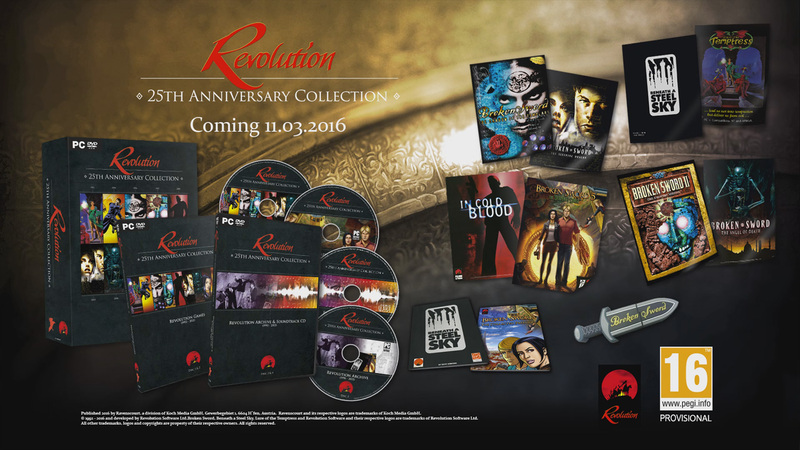 London, 27th January, Revolution is proud to announce the forthcoming release of the Revolution: the 25th Anniversary Collection box set on 11th March 2016, exclusively on PC, at a price of £ 29.99 / 39,99 €. Exclusive Interactive Timeline with 25 years of behind-the-scenes assets and information, as well as six episodic documentary movies covering the 25-year history of Revolution and its games.